The HTC Desire 200 is not a cutting edge smartphone in any way, but it compensates for its lack of horsepower with cuteness, something that you can see in the leaked images right below. It’s a 3.5-inch device that is made for those on budget, who’d still like an entry-level smartphone. 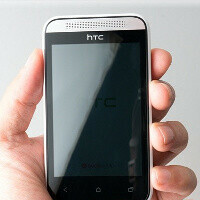 The HTC Desire 200 only comes with a single-core processor and boasts 512MB of RAM. It runs on Android 4.0 Ice Cream Sandwich spiced up with Sense 4.0. It’s got Beats Audio for better performance in the low tones and that speaker grill you’ve seen in the HTC One. HTC is planning on releasing the device in Asia first, but we would not be surprised to see it in Western markets as well. For once, it’d be extremely convenient for single-handed use. Wow. That is actually kinda cute. Nice to see the design cues coming to the lower end HTC devices. Those pictures are actually really good for low end devices. looks like htc one nano. It's not called "ruining a design" it called "having a design that resembles the flagship". You have got a problem with it does'nt mean everyone else does too. The Samsung Galaxy S duos and Samsung Galaxy S3 mini both look great, they are resembling the flagship. But they actually look better than S3. This phone looks pretty great, too. Also, htc phones have the same style. If you have'nt noticed, Htc phones look a bit alike, even Htc One X looked like others of their phones, including the low-end ones. Stop hating and bitching please. I found that really offensive because you are saying something bad about a great-looking design for well, hardly any reason. This makes me think that Google edition phones should be available in low end models. Actually, low end models need it more than flagship models because manufacturers couldn't care less about updating them. cute but sadly, horrible specs.. snapdragon s1 proc just screams lag. check youtube vids on unboxing on the phone. freakishly slow, HTC will ask $300 off contract for this. Only 1230mAh? Come on HTC, you can do better than this.